Girl power was in full force on the ARIA singles chart this week in 1989, with the top three new entries all coming from female performers. And not just any women - all three recording artists were hugely influential in their respective genres and role models for different segments of the population. Of course, one was a former drug addict, another would become more reliable for controversial quotes than hit singles and the third would go on to star in shonky schlock horror made-for-TV movies, but this week in 1989, they were all right at the top of their game. It was more good news for women at the top of the singles chart with the entire top 6 comprised of female performers (or, in the case of Roxette, a female-fronted act). The news wasn't so great for The Bangles, who once again lost their hold on the number 1 spot as Bette Midler's "Wind Beneath My Wings" returned to the summit for a second week. It was one of the five Singles Of The Week on last week's chart and this third release from the house duo became the first (of the five) to register as a breaker on the ARIA chart. Of course, Inner City's two previous singles had already popped up as breakers so seeing them here was nothing new - even if the fact that some of the best house music around couldn't break through in Australia was getting a little bit old. "Ain't Nobody Better" didn't perform quite as "well" as "Big Fun" or "Good Life", which had both stalled in the 50s - but since it's wasn't quite as good a song, its number 67 placing is relatively appropriate. If I'd had my way, all three songs would've hit the top 10, as they did in the UK - although in some ways it felt good to be in on a secret the majority of the country wasn't aware of. Younger music fans may remember him from his stint on the most boring reality show judging panel of all time - he sat alongside Marina Prior and James Valentine on celebrity duet series It Takes Two - but those with longer memories will know Ross Wilson is an Australian music legend. A member of two classic bands, Daddy Cool and Mondo Rock, he was responsible for a good number of hit singles in his time. Unfortunately for Ross, his solo career wasn't as landmark - and this first single under his own steam since 1976's "Living In The Land Of Oz" (which reached number 46) would be his highest charting. For her follow-up to "Stop! ", Sam Brown chose a song that was originally released in the year before she was born. Written by the legendary songwriting trio of Holland, Dozier & Holland, "Can I Get A Witness?" was a single for Marvin Gaye in 1963. Interestingly, the song appeared on the soul legend's first greatest hits collection, which he released in 1964 after only three studio albums and despite having only managed one US top 10 hit by that stage. Obviously, Marvin would go on to rack up many big singles in his career, but one top 10 hit is all Sam Brown managed either here or in the UK, with this remake becoming her second highest-charting song after "Stop!". Australia really did take its time in the '80s. 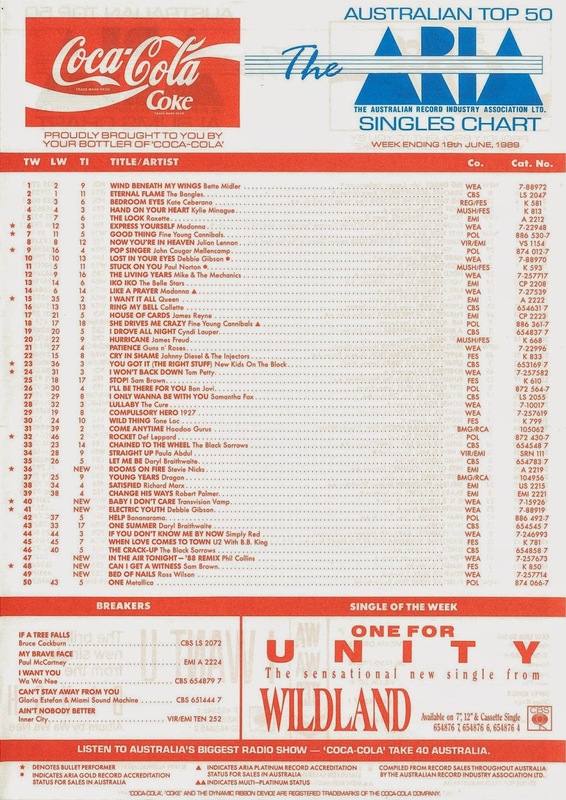 Just when you thought Petula Clark's "Downtown '88" was the last song we'd see from 1988 popping up in 1989, here we are halfway through June 1989, and an '88 remix just managed to sneak into the top 50. This remix of Phil's debut solo single from 1981's Face Value album was actually released in the UK prior to his previous two singles in Australia, "A Groovy Kind Of Love" and "Two Hearts" - in fact, it hit the UK chart exactly a year before it reached our top 50, so we really were slow on the uptake with this one. "In The Air Tonight" has a habit of revisiting charts around the world for one reason or another. I can't determine the reason for this particular remix (anyone know what prompted it? ), but it returned the song to the UK top 5. Meanwhile, the song had also proved popular after its use in Miami Vice's first episode in 1984 and would have something of a renaissance after that drumming gorilla Cadbury ad in the mid-'00s - both times prompting chart action in different parts of the world. In fact, it's probably about due for another chart run soon. I was beyond excited when Debbie Gibson's second album, also titled Electric Youth, was released in 1989. My sister had brought me back the cassette of Debbie's debut, Out Of The Blue, from the US and she'd quickly become one of my favourite singers (Debbie, not my sister). While previous single "Lost In Your Eyes" had been a straightforward DG ballad, this second single from the album was the singer/songwriter's "Bohemian Rhapsody". A five-minute opus featuring a bridge, an instrumental break and various other elements, it was far from the three-minute pop ditties with which she'd made her name in 1987. I loved Debbie so much I even bought the sheet music for a selection of her songs - but "Electric Youth" didn't really lend itself to bashing out on the piano. Making use of a guitar riff we'd be hearing a lot of in 1989 (thanks to similar sounding hits by Sam Kinison and Roxette), Wendy James et al stopped re-releasing songs from their first album and finally got around to unleashing this lead single from second album Velveteen. The Vamp couldn't have asked for a better positioning statement, with "Baby I Don't Care" summing up their post-punk, don't-give-a-damn attitude perfectly. The band would shortly have something to worry about, however, since nothing else from Velveteen would do anywhere near as well as this, their highest-charting single both here and in the UK. One of my favourite ever interviews was with Stevie Nicks a few years ago. I'd been warned ahead of time that if she was enjoying an interview, she'd tell the operator who connected the call and would break in to wind it up at the allocated time that she wanted to carry on. Obviously that knowledge came with some pressure - what if she didn't want to continue the interview? Did that mean I'd done a bad job? Well, the good news was that, true to form, Stevie did push our chat into extra time and, since there's obviously so much to discuss when it comes to the Fleetwood Mac lynchpin, I got to tick off all the topics I wanted to cover. This lead single from her The Other Side Of The Mirror album wasn't one of those topics, purely because it's not one of her most noteworthy songs. At least, that's what I thought. Turns out it was inspired by her relationship with the album's producer, Rupert Hine (who'd landed a minor hit in Australia in 1981 with "Misplaced Love") - a romance that, by the sounds of it, was a typically tempestuous coupling for Stevie. Despite that, "Rooms On Fire" didn't, er, set the charts alight and felt like a bit of a disappointment after her brilliant pop/rock tracks of the mid-'80s like "I Can't Wait" and "Stand Back". Next week: Greenies invade the ARIA chart (well, they try), plus my second-favourite Australian band of all time return and Stock Aitken Waterman win some, lose some. Before that, my top 100 for 2005 is ready to go so I'll (hopefully) start counting that down soon. Although I listen to a lot of male artists (mostly as a casual fan), I always preferred when the chart had plenty of female artists/vocalists. In late 1987, there seemed to be a dearth of them (Madonna being the only one in the top 20 some weeks), and I remember a similar thing happening in the first half of 1993. Inner City were surely the king and queen of Breakers that didn't quite break through in 1989. Maybe if they'd done a brief promotional tour it could have helped, though possibly not. Maybe they did - I remember they reviewed the singles in the local Smash Hits around August or September. I remember seeing the cassingle for Sam Brown's 'This Feeling' (the follow-up to the first release of 'Stop!' in Europe) in record stores around the same time as 'Can I Get a Witness?' was in the charts. It was definitely an Australian pressing (the lovely yellow cassette case), and I wondered what it was. I never heard the song or saw the video anywhere though at the time. Going by the catalogue no. (on a friend's list), it looks like it was released (or at least pressed) soon after the initial release of 'Stop! ', but obviously disappeared without a trace. Although there wasn't all that long a gap (only about 4 months) between the first release of 'Stop!' and when it cracked the top 50. The 'Stop!' album was also re-issued with 'Can I Get a Witness?' tacked on. Maybe the record company didn't think there were any follow-up hits to 'Stop!' on it and made her record this cover/release it as an A-side? And that's Constable Reg from The Bill playing Sam's boyfriend/the defendant in the courtroom! The '88 remix (love how it didn't chart here until mid '89) of 'In the Air Tonight' was something of a mystery to me at the time. I'd never heard it, or even heard of it, when it crept into the top 50. Rage of course just played one of their interludes with the artist/title the week it was in the top 50, due to there being no video. I heard it on the radio a few weeks later. Quite surprising in retrospect that classic-rock loving FM 80's radio would touch something remotely 'dance'. Though I like it, there's something about this remix that makes it sound even more sinister than the original to me. But listening to the video you've posted now, it's different to the dancier extended version I heard on the radio and know - https://www.youtube.com/watch?v=rVbTit4vEb8 . It puzzled me why Transvision Vamp didn't name the song 'Honey I Don't Care', given that Wendy sings 'honey' far more often. Though 'Baby...' sounds like the better title. 'Rooms of Fire' was oddly Stevie's biggest solo UK hit, and one of only two solo top 40 hits (excluding one as a featured artist) she scored there, the other peaking at just #40. Even her Fleetwood Mac-fronted singles 'Gypsy' and 'Seven Wonders' missed the UK top 40, and the one you'd assume was a massive hit, 'Dreams', peaked at just #24. I guess the UK just didn't warm to her for some reason. Sounds like Sam Brown did a Sophie Ellis-Bextor and remodelled her debut album halfway through the campaign. I believe there were two remixes of In The Air Tonight - one by Phil Collins and original co-producer Hugh Padgham. The other was done by Ben Liebrand, which I think is the one you've linked to. I forgot to mention, the version of In The Air Tonight I've linked to is the same one that appears on Now! That's What I Call Music 12, which usually features the official single versions and in this case that was the version on the 7" single. The Ben Liebrand "extended mix" was an additional remix available on the 12" and CD single. I am a big fan of 'Rooms Of Fire'. I always think of it as a big hit, cause it gets played on the radio pretty often and was on 'Hits of 1989 Vol.3'. I thought her 2001 single 'Everytime' was fantastic and would be a big hit when I first heard and saw the video on Max that year, but was not to be. At least I played my part and purchased the single off iTunes about 5 years ago. LoL. Even though I don't own a Stevie Nicks album or am a big fan, I still think she would be one of the most interesting people to talk to re her life and music in general. I have never heard the Phil Collins '88 mix of 'In The Air Tonight' (although I will be checking out the video here and Nathan's link to another version. I can't stand the original, as it is way too slow and feels like it goes way too long. I have no idea either why the '88 remix came about? Gavin, I was infatuated by Debbie Gibson too. She really caught my eye with the 'Shake Your Love' video and 'Electric Youth' didn't disappoint at all. A little embarrassed by it now, but hey, I was only 14. Funnily enough, I never bought any of her albums. I think I was more caught up in her than her music. A couple of years ago her and Tiffany did a tour of the US and I saw them both perform together on the talk show 'The View'. It was funny, but very nostalgic. and finally, 'Bed Of Nails' is absolutely brilliant. I love it. I think it is Ross at his best. I love 'Rooms of Fire', too. During a trip to Batman Records (second hand record store) in the Melbourne CBD (it's not there anymore) in 1999, I bought the cassingle for $3 something. I don't think I'd heard the song since 1989 and I wanted to hear it again. Oh, the things we did before downloading. It really seemed like Debbie Gibson was going to have staying power when 'Electric Youth' came out. Strange it was her last real hit. Of course I meant Rooms ON Fire. I even managed a visit to Batman Records in the mid-90s. I bought a 7" copy of Koo De Tah's "Body Talk" and Princess' album on vinyl. Was very impressed with those finds. I kind of miss the days of trawling through second hand record stores. I used to visit Gaslight too, Finn, whenever in the city, and Central Station. I never knew about the one in Swanston Street though! Au Go Go's upstairs collectibles section was another one. I used to love flicking through the A-Z section of 7" singles in Batman Records. So many 80's sleeves I'd never seen (before it was easy to find this stuff online). I had a few actual laugh out loud moments to myself (quietly) at some of them. Until today i had forgotten the Ross Wilson track, was pondering if it were an original of the Alice Cooper hit a few years later. Silly Me! Anyway I do like it alot but you probly expect that from me. Couldn't stand the Sam Brown cover and often wondered how she failed after the sultry 'Stop!'. The album btw is terrible! I have no idea about the Phil Collins remix but i can varify I was still hearing it sparingly in the mid 90's still on radio in Sydney. Transvision Vamp are a band I find tricky to pin their 'it' song on, is it this or 'I Want Your Love'? I personal think it's the latter but I don't mind this one either. 'Rooms On Fire' is definitely on of Stevie's career highlights for me, stood the test of time in my book. Thanks for reminding me about the compilations chart. I had in mind to mention it when it began... so expect to see the very first compilation top 5 in a couple of weeks! Sister Moon was probably my fave T. Vamp single too, though you can't beat 'I Want Your Love' its pure infectiousness.